The successful demonstration of this advanced fiber-optic sensor network will provide spacecraft operators with a lighter, more compact, and lower power-consuming centralized sensor system especially critical for the monitoring of temperature and pressure. November 2, 2009 - For the first time, a fiber laser, incorporated into an all-fiber-optic sensing system is in space now that the European Space Agency’s PROBA-2 hit orbit. MPBC’s Flight Sensor Demonstrator is one of 17 newly developed space technologies being tested on the flight. 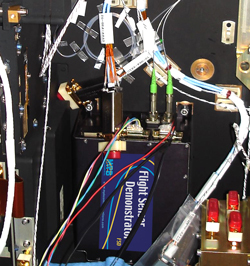 The Flight Sensor Demonstrator consists of a tiny fiber-optic laser which collects and processes information from 16 fiber sensors mounted through the satellite’s propulsion sub-system. The sensors measure temperature at different locations in the propulsion system and the spacecraft, as well as, the xenon tank pressure.